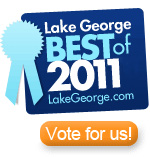 Please vote for us as the Best Of Lake George! Enjoy Horseback Riding Year Round in the Beautiful Adirondacks! This is an Adirondack adventure that you will never forget. Begin with a guided ride that winds its way through wooded trails and brings you to the top of Beech Mountain where you will dine to a spectacular view overlooking the Adirondack Mountains, Lake George and Lake Vanare. Minimum age is 12 years of age. Must be able to ride horse without being led. Rides leave daily at 5pm. Open Memorial Day through Labor Day. LOCATION: On Route 9N South - only 5 miles from Lake George (Northway Exit 21) going south toward Lake Luzerne. Call (518) 696-4444 for Reservations. Web site hosting and internet marketing by Mannix Marketing Inc.